Each week, as Sr. Social Media Manager at LinkedIn, I get to share breaking LinkedIn news with the rest of the world and fellow bloggers (many of them product related). This weekly series covers the LinkedIn stuff that you may have missed — with a little context into why it matters and to whom. Who should care? Any professional. Consider this a real-world water-cooler conversation with folks who are of mutual importance to your career (assuming you’re connected to them). And, if you’ve an iPad then this app is a no-brainer. I, so badly, want an iPad now. I know, a lot of people find it funny that I don’t have one yet. cc: @adamnash. BTW, if you’d like to see a video demo, I’d recommend the TechCrunch interview with Mike McCue. Who should care? This is such a no-brainer for event organizers. Madhu also shares a recent implementation from Microsoft on their Partner event website. The integration is pretty slick. As you can see — you can flip through the top groups threads even without being signed in. 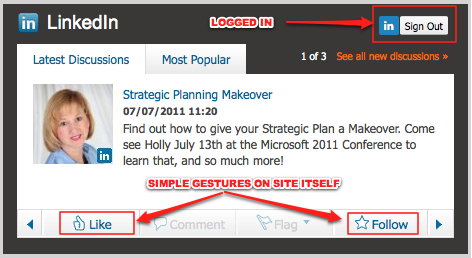 If you’d like to perform simple gestures (“Like” or “Follow” the conversation), you’d need to be signed in on the website where this is embedded. 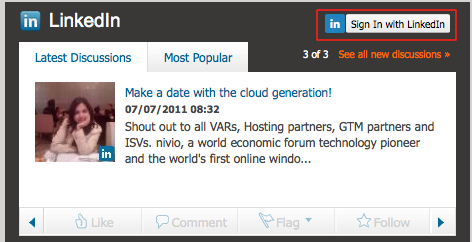 And, if you’d like to actually participate in the group all you’ve to do is click through to the specific LinkedIn group page. And, you guys know how that works. The group itself is a great way for conference attendees to introduce themselves, share questions they have that’s worth a separate group thread and say Hi to folks they didn’t get a chance to interact at the conference room floor or at the sessions. This was my experience on Social Media Examiner’s LinkedIn Group (private group – requires sign in), as I discovered when I spoke at their webcast recently. I used the LinkedIn group to collate ideas and feedback on my presentation and was able to tailor it better to the audience’s needs. It’s also a great way to follow up with your audience once you’re done. Now imagine, the power of that conversation embedded on your website drawing more participation before and after the event. I just realized as I blog this, that this topic deserves a whole new post. Given that we spend much of lives at work, it’s important that we get to work not only with the brightest minds, but with genuinely nice folks. It’s a joy to work with such folks at LinkedIn (more on that here), but this week’s story on our blog was an inspirational one about our colleague from New York, Jill Levine. I’ll let Jill share the story herself. Speaking of great colleagues, just thought it was worth mentioning that Adam, Jim and I are currently on a #blogfitness program. We’ve each taken up the challenge to blog, a post a day. You can read the specifics on Jim’s post here (click through just for the video of Jim doing burpees – priceless!). And, Adam, well he’s started off strong with a post on Quicken solution for OS X Lion. And, Adam’s famous T-shirts post just got picked up on TechCrunch yesterday. Nicely done. If you’d like to support or taunt us about missing a blog day, feel free to tweet us @mariosundar, @adamnash and @brikis98. And, if you’re a blogger suffering from blogger’s block. You too can join us in our 30-day #blogfitness diet. Leave a comment.